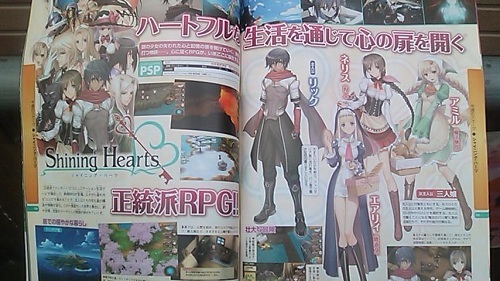 Shining Hearts announced as a PSP RPG. If you initially read that and got a little excited that it might have read ‘Shadow Hearts’ instead, we can be best friends. Instead, this is actually a new entry into the Shining series, one of Sega’s incredibly few RPG franchises. Going the same route in fact as Phantasy Star and Valkyria Chronicles, this too will be a PSP only release. It’s described as a traditional RPG, so expect a lot of taking turns and quaffing potions, and the story follows scarfed hero Rikku as he travels with the three sisters ?Neris, Airy and Amaru. The theme will apparently be ‘opening your heart’, involving a girl who has lost her soul somewhere along the way, so I wouldn’t be at all surprised if there are some dating sim elements thrown in for good measure. That is unless those sisters were -his- sisters. I bet they just adopted him after his family were brutally murdered and he was left orphaned though. That sounds like an RPG plot at least. Sadly, there’s nothing else to go on, with no gameplay reveal or any real screenshots at all and just RPG clichés to use for wild speculation. Still, I like RPGs so one more can’t be anything bad. If it actually gets localised, mind.